Here is the third excerpt from the television interview I did on June 21, 2016, on "Gate City Chronicles", hosted by Kevin Avard. In this bit, we're talking about the plot of A Buss from Lafayette. Deedy held the mob cap of some lady named Jane Austen. We guess this is a writer thing. Here's Deedy (Dorothea Jensen to you) again, talking about something that happened almost twenty years ago. Good grief. We wish she'd stop dwelling on the past, get back to the present and write more of our stories! Oh, well. Love, Bizzy, Blizzy, Dizzy, Fizzy, Frizzy, Quizzy, Tizzy, and Whizzy. As those of you know who have watched my video blogs (click here), or watched my tv interview #2 (click here) or read my written blogs, I got the idea for A Buss from Lafayette while on a Jane Austen tour of England in 1997. That was when I received the "indirect" buss (kiss) from Lafayette via a woman whose great-grandmother had been kissed by him in 1824, and who passed that kiss down in the family and on to me. I recently remembered an amusing incident from that tour which I have decided to relate to you. 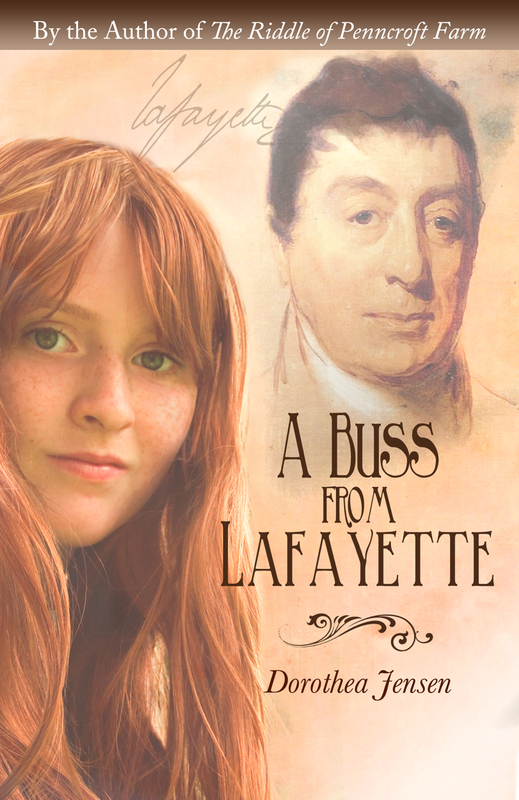 It is linked only tangentially to A Buss from Lafayette, but I'm writing about it anyway. First of all, you must understand that this was the first tour put on by the Jane Austen Society of North America, of which I am a life member. For a Jane Austen lover, it was a wonderful experience. We visited Steventon (the site of the house in which she was born), London (where she stayed with her brother and we also saw and handled the collection of her surviving manuscripts then housed at the British Museum), Bath (where parts of both Northanger Abby and Persuasion were set), Godmersham (the estate where Jane Austen's brother lived) and many other Austen locales. One of these locales was Lyme Regis, the seaside town where Louisa Musgrove falls from the Cobb in Persuasion. As our bus was approaching the town, I could hear the tour organizer and British tour guide chatting in the seat ahead of mine. Apparently they had been contacted by a woman who said she was descended from Jane Austen's brother, Edward, who had been adopted by wealthy relatives and subsequently changed his name to Knight. 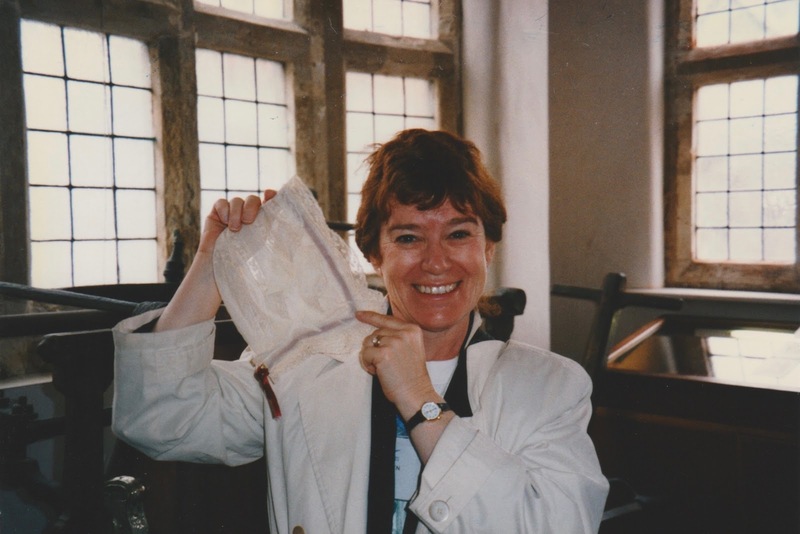 This purported descendant had told the tour leaders that she had a number of Jane Austen artifacts that had come down in her family and she wanted to show them to us. The problem was that no one knew 1) if she was actually an Austen descendant; or 2) if what she had to show us were genuine Austen heirlooms. Also, the tour was on a tight schedule and the tour leaders did not want to be delayed by someone who might be a loony tune. I heard them decide to meet with her, but to do what they could to keep the encounter as short as possible. 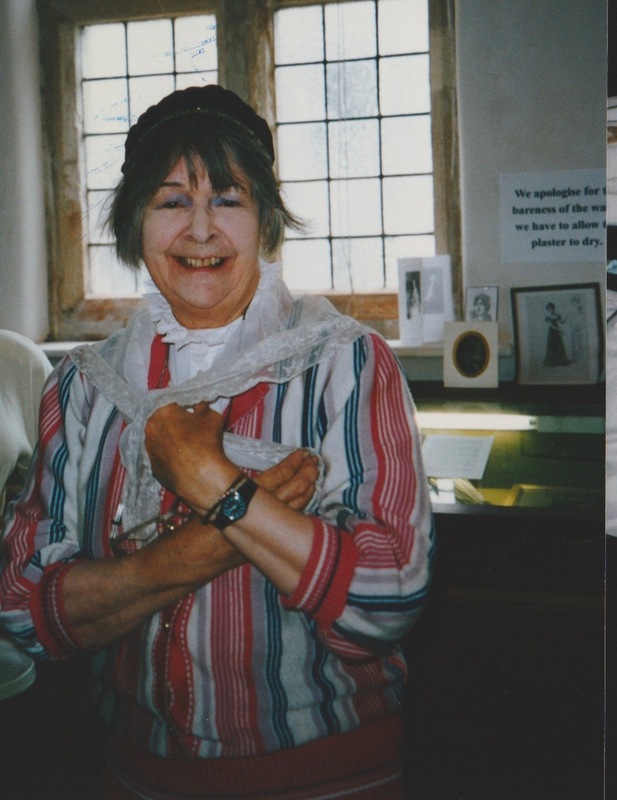 When we arrived in Lyme Regis, this is the woman who met us at a museum, carrying a number of bags. I don't remember her name, but I wrote down "Mrs. C." on the back of one of these pictures. Was she really a descendant of Jane Austen's wealthy brother? I watched the tour leaders' reaction: they didn't seem convinced. Then Mrs. C. started pulling things out of her bags. Something she showed us, some document or other, did seem to indicate that she was the Real Deal. 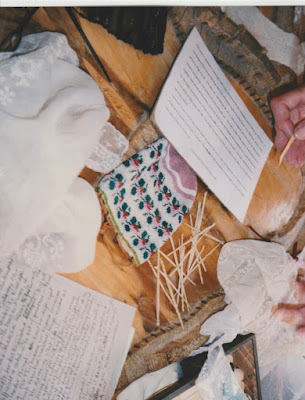 1) A set of scrabble-ish letters like those used in Emma to spell out coded messages between secret lovers, and some "spillikins" (pick up sticks). Mrs. C. said they had belonged to Jane Austen. 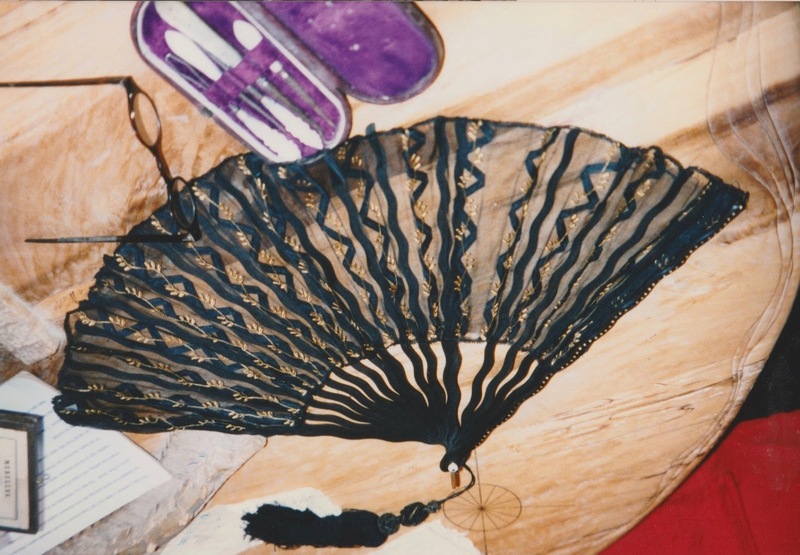 3) An ebony fan that had belonged to Jane Austen. 5. A pair of Jane Austen's gloves. 5. And a lace cap made and worn by Jane Austen herself. Meanwhile, the tour leaders kept trying to hurry Mrs. C. along so we could get on to see Lyme Regis. Our schedule, you know. But I had questions for Mrs. C. Lots of questions. Every time I asked another one, however, the tour leaders did not look pleased with me. Especially when I was allowed to hold Jane Austen's lace cap. I don't know if subsequent Jane Austen tours have scheduled in Mrs. C, or whether it was eventually decided that these items weren't authentic. She, and they, were real enough for me. 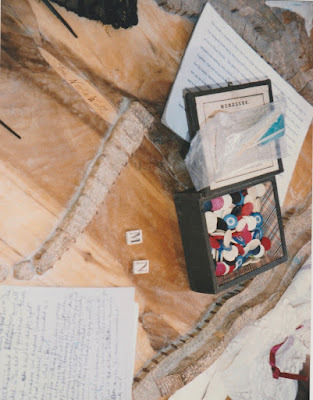 Center: letters from a word game like those used by Frank Churchill and Jane Fairfax in Emma. I think they came from the box of game pieces on the right. An ebony fan and a grooming kit. 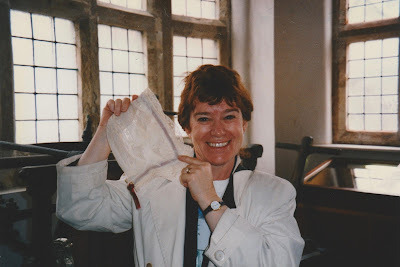 Me holding Jane Austen's cap. Those of you who have read A Buss from Lafayette know that such a mob cap figured in my story. Just for good measure, here is a picture of me standing on "Granny's Teeth" on the Lyme Regis Cobb. 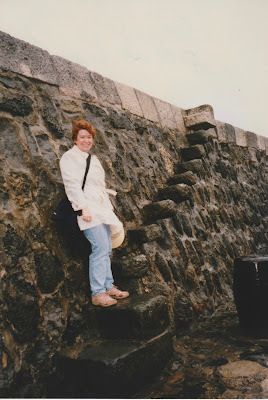 These precarious stairs down from the Upper Cobb to the Lower Cobb might have been the ones where Louisa Musgrove fell and ended up with a severe concussion. [Captain Wentworth] advised her against it, thought the jar too great; but no, he reasoned and talked in vain, she smiled and said, "I am determined I will:" he put out his hands; she was too precipitate by half a second, she fell on the pavement on the Lower Cobb, and was taken up lifeless! We Izzy Elves really were shocked when we saw this latest post that Deedy (that's Dorothea Jensen to you) wrote about how long it has taken for her to re-start writing this historical fiction novel for kids. We sincerely hope it doesn't take her this long to finish writing our stories! I know "Tempus Fugit", but how shocking is THIS! 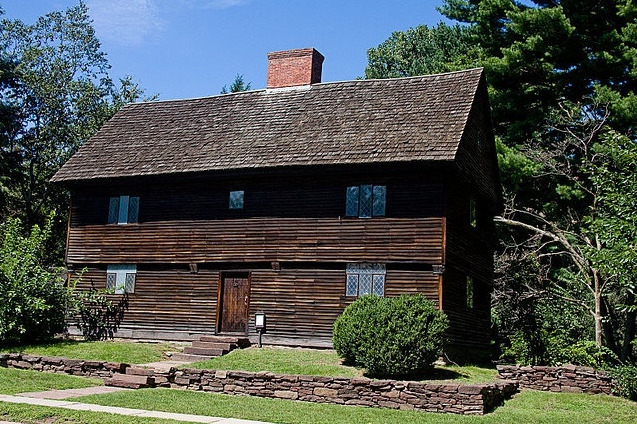 The 17th century house in Wethersfield, CT, that might have been the setting for The Witch of Blackbird Pond, one of my childhood favorites. My new story will be set in the same era, albeit in Massachusetts instead of Connecticut. I actually came up with the idea for this story a long time ago, did lots of research, took lots of notes, and wrote the first three chapters. Then, for a variety of reasons, I stopped working on it. I knew it was quite a few years since I did anything with Scalp, but when I found the box in which I'd stowed away what I'd done so far, I was in a for a genuine shock. The date I found on the notes I had taken was (are you ready for this?) 1993! Better get back to work before any more tempus fugits!